Poetic Byron might be mad, bad, and dangerous to know. Or maybe it’s just a relatively uncommon alternative to Dylan. There’s nothing particularly romantic about the name’s origins. It’s one of those Old English place names, still on the map, sometimes listed as Byram or Byrom. Regardless of spelling, it refers to cow sheds, from byre – a barn. The last name might’ve been give to someone who lived nearby, or perhaps someone who worked with cattle. But all we think of when we hear the name is George Gordon, better known as Lord Byron. George became one of the most enduring of all English poets and a leading figure in eighteenth century Romanticism. He penned his take on the Don Juan legend in 1821; he lived it for many years before. George inherited the title from his uncle at the tender age of ten. 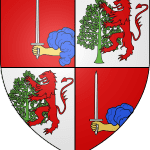 George’s dad was nicknamed “Mad Jack.” His grandpa answered to “Foulweather Jack.” And the 5th Baron had been known as “The Wicked Lord” following an infamous duel in his youth. You get the sense that the family didn’t produce a lot of accountants. George could even trace his tree back to King James I on his mother’s side, but noble birth doesn’t necessarily equal upstanding behavior. Among his scandalous liaisons was a long-standing affair with Lady Caroline Lamb – she’s credited with coining the “mad, bad and dangerous to know” epithet. A true risk-taker, Lord Byron fought in foreign wars, including the Greek War of Independence. He died of a fever while in Greece. The Greek people embraced his sacrifice, and the given name Vyron was sometimes bestowed in his memory. Just like some boys were named for poets like Virgil and Homer, some baby Byrons were probably inspired by the poet. 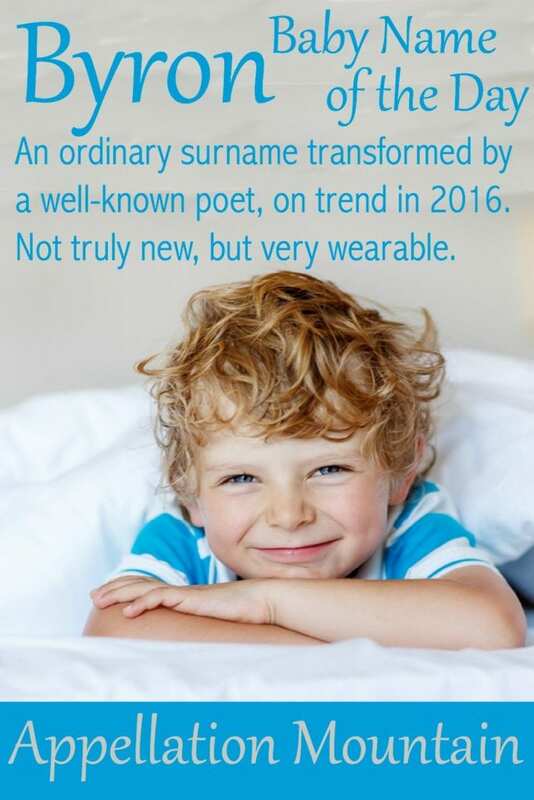 However, given the long and steady use of the name, chances are that many boys were wearing a family surname. You might think of comedian Allen, the NFL’s Leftwich, former Supreme Court Justice White, or a handful of other notables. There are minor characters by the name in two William Faulker novels, too. Another reason for the name’s success? The upbeat Irish Brian caught on in the 1940s, became a sensation in the 1970s, and remained in the US Top 100 through 2009. Even though Byron had much more history, the name peaked at #196 in 1967, while Brian continued to climb. What explains that 1960s peak? Besides all of the other reasons, blame it on a surfer girl. The successful 1957 novel Gidget about a diminutive teenager growing up on the beaches of Malibu. Fellow surfers in her circle included boys named Moondoggie, Stinky, Kahuna – and Lord Byron. A favorable review ran in The New York Times and sequels galore – as books, movies, and a television show – followed. The character appeared in the movie, but didn’t make the leap to the 1965 television adaptation – which might explain why the name fizzled. In the 1990s, Beverly Hills 90210 Dylan McKay wore the name of one poet, but embraced the whole mad-bad-dangerous identity – at least when the character first appeared on the series. More recently, edgy sitcom Arrested Development gave this name to the youngest Bluth brother, though he usually answered to Buster. Lost alum Matthew Fox gave this name to a son back in 2001. At the time, fellow surname Bryson was rising, and it seemed like both names might follow the two-syllable, ends-in-n trend to wider use. Bryson peaked just inside the US Top 100 in 2011, but Byron failed to catch on. And yet, the name never became so popular that it seems dated. Instead, Byron might make a choice equal parts poetic and bold, familiar and unexpected. 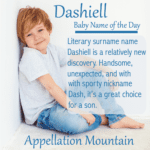 What do you think of this name for a son? 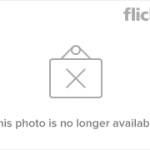 This post was originally published on December 10, 2009. It was substantially revised and re-posted on August 23, 2016. I love it! In Greece, it’s actually Vyronas and fairly common. I also like Myron/Myronas, even though it’s a totally different name. Boys named Byron in Australia are more likely to be inspired by the popular and super trendy Australian beach town Byron Bay. It’s also a well known surfing spot, so is often a popular pick for parents with a love of surfing. Thanks, Brooke C – Australia has SUCH great place names! My husband is Byron. I can’t tell you how many times DAILY that people call him Brian. It’s constantly correcting people and to the point now, most times, he doesn’t even correct them. I love his name, but it certainly is hard for most people. Whoops, another incomplete entry…I’m only seeing the first sentence. I thought it handsome, stylish, quirky, the works a few years ago and then I found out what it meant. It’s gradually lessened in my estimation. Having lived on a dairy farm for a few years as a child, I don’t want to be reminded of this http://www.careers.govt.nz/image/data/Dairy_farmer_Kevin_drinkwater_ss_%283%29.jpg every time I called my son’s name. Believe me, the milking pit is not a cheery place to be when a cow (or two, or three) decides to take an impromptu dump. I also dislike the similarity to the dour middle aged Brian. I can definitely see the appeal in Byron. He is very distinguished and a bit of a hipper version of the overused and dated Brian. I like Byron! We have one down the street with little sister Claudia. He’s adorable and a bit mad, truly. A daredevil on the local playground. Can’t wait ’til he starts school next fall. I think Byron’s dashingly handsome and strong. I wish I’d run across it more often!